I would like to take this opportunity to welcome you to our new Notre Dame website. 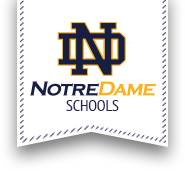 If you are considering Notre Dame for your child's education, I would like to invite you to come and visit - meet our faculty, staff, and students. If you are an alum, thanks for taking the time to check in on us! We're looking to update information on all our alumni, and also welcome you to send in old photos that we can use on this site, in publications, and for reunions. And if you are a parent, we hope to provide you with the information you need to help your student excel. At Notre Dame Schools, we pride ourselves in the accomplishments of our students -- not only our 100% graduation rate, with 100% of those students going on to pursue higher education - but also on the young men and women that those students become. At ND, we believe in stressing the morals and values rooted in the Catholic faith. We believe that working hard and serving our community shapes the leaders of tomorrow. We believe that all students are individuals, who grow and flourish in many different ways. As always, I wish to thank you for your support of Notre Dame, our students, and our mission.